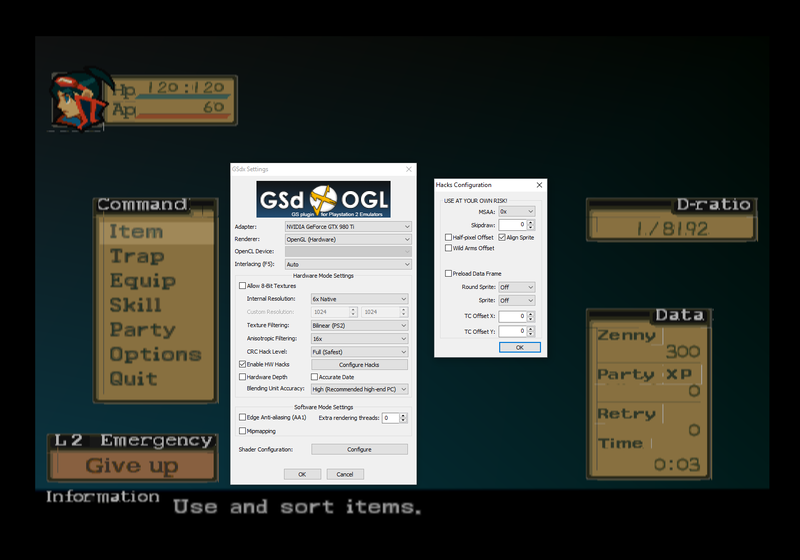 BoF5:DQ - Cannot fix text. Try out one of the newest versions of the emulator from here, they have improved graphics accuracy. What kind of hardware are you running? If you have a Nvidia graphics card use the OpenGL hardware renderer. Align hack is not present in the latest stable. You need a git version as already suggested. This is the latest build available on that linked site, with recommendations. It still has the boxes around elements. The 0500-0500 tc offset worked. Thanks a lot! A random 2nd question, is there a way to set game presets, or do I need to write these down somewhere and re-input the working settings from game to game? (12-14-2015, 10:22 PM)Bkral Wrote: The 0500-0500 tc offset worked. Thanks a lot! A random 2nd question, is there a way to set game presets, or do I need to write these down somewhere and re-input the working settings from game to game? I've been using PCSX2 bonus in that link for a long time now, it works very well. It's a godsend since PCSX2 needs a lot of fiddling with things on a per-game basis.